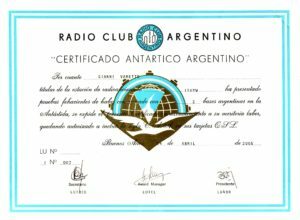 The “Certificado Antartico Argentino” (Argentine Antarctic Award) is issued to OMs & SWLs that make evidence of contacts with stations located on the Argentine Antarctic Bases (LU-Z). Argentine stations must accredit 3 (three) different Bases.. Foreign stations must prove 1 (one) contact only. Contacts valid as of November 20, 1945. W.A.A.B. 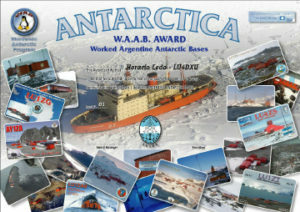 ( Worked Argentine Antarctic Bases ). 3 different Argentine Antarctic Bases. number 2 to get the Award. 5.- Contacts made from November 09, 2001 onwards, are available. LU4ZS Marambio – LU1ZAB Matienzo. 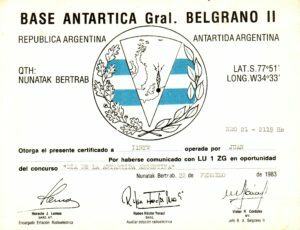 7.- Any new Argentine Antarctic Base on the air, will be add to the list and available to get the Award. this Country has been followed, and a detailed list of the contacts made and confirmed in alphabetical number’s order as: Callsign, Date of QSO and GMT time. A Copy of QSL cards of the contacts submitted. The Award fee is: A3 u$s 17,00.- (Euro 13.00.-) or A4 u$s 13.00.- (Euro 9.00.-) include shipping via certificate post mail inside a tube for safety protection. Payment can be send via Western Union to: Horacio Enrique Ledo – DNI 11.451.210 or by certificate envelope to the box # in point # 8. 10.- W.A.A.B. Award consists in a full colour personalized parchment paper A3 size 297×420 millimeters. the lowest possible bonds and bureaucracy.